Be the first to share your favorite memory, photo or story of Viva. This memorial page is dedicated for family, friends and future generations to celebrate the life of their loved one. Viva G. Lawson, 79, died Sunday, April 7, at her home, following a brief illness. Born to Roy and Grace (Keogh) Rylander in 1939, Viva grew up in greater Worcester, Massachusetts, and had especially fond memories of her childhood years in Boylston. 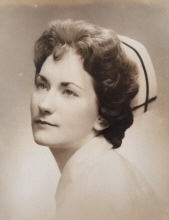 She graduated Shrewsbury High School in 1957 and Memorial Hospital School of Nursing in 1960. After working many years in geriatrics she finished her career at Planned Parenthood of Greater Ohio. While Viva enjoyed quilting, gardening and cooking, she took her greatest joy in visits and long phone chats with family and friends. Viva married Tedford Lawson in 1960. Surviving her are all five of their daughters: Lori Demars of Missouri City, Texas; Linda Lawson of Concord, New Hampshire; Nancy Arnold of Fuquay-Varina, North Carolina; Elizabeth Vollmar of Bowling Green; and Jane Fye of Loveland, Ohio. Other survivors include six grandchildren, one great-grandchild, three sons-in-law, a sister, Janice Riedl of Brewster, Massachusetts, and various cousins, nieces and nephews. She was predeceased by her first grandchild in 2017. A private celebration of her life will follow cremation. Arrangements have been entrusted to Peinert-Dunn Funeral Home,18620 Washington St. Tontogany, Ohio. To send flowers or a remembrance gift to the family of Viva Lawson, please visit our Tribute Store. "Email Address" would like to share the life celebration of Viva Lawson. Click on the "link" to go to share a favorite memory or leave a condolence message for the family.